In 1783, as Americans adjusted to peace time following the Revolutionary War, a young man’s incredible adventure story was published in Hartford. John Ledyard’s Journal of Captain Cook’s Last Voyage recounted Ledyard’s travels with the world-famous British explorer on his third and last exploration of the Pacific Ocean. Between 1776 and 1780, while most Americans were fighting against British soldiers and seamen, John Ledyard, born in Groton, Connecticut, was aboard Captain Cook’s ship, the Resolution, encountering new lands and new peoples in the northern and southern Pacific, the Arctic Ocean, and along the coast of Alaska. Ledyard was a unique and independent character, an adventurer at heart with great ambitions and a deep interest in indigenous people and cultures. At the age of 20 he quit Dartmouth College by building his own dugout canoe and fleeing down the Connecticut River to Hartford. He became a sailor, was coerced into joining the British Navy, sailed with Captain Cook, traversed Russia and Siberia by himself without any money (until he was arrested and thrown out of the country), and began an exploration of Africa before dying of an intestinal ailment in Cairo at the age of 37. His tale of Captain Cook’s voyage was a best-seller in Connecticut and the newly-independent United States, and it led to some fame but little fortune. 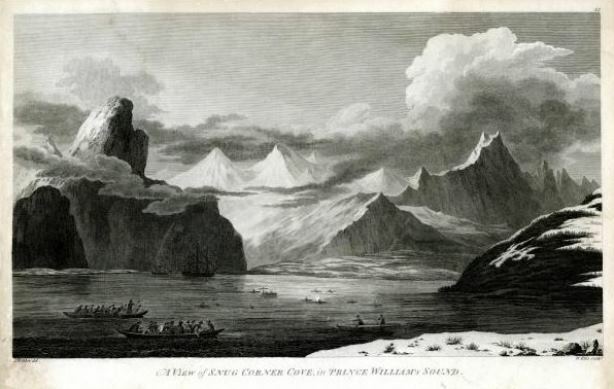 The book’s success was eclipsed by Cook’s own three-volume A Voyage to the Pacific Ocean, published posthumously less than a year after Ledyard’s account. (Cook was killed during the voyage in a confrontation with native Hawaiians.) Cook’s “official” account included a series of 87 engraved maps, charts, and illustrations. Ledyard’s book had no illustrations except for one map. In 1783, the same year both books were published, Jeremiah Wadsworth, a successful merchant from Hartford, purchased Cook’s volume in London; it’s possible he sought it out after reading Ledyard’s book. The engravings that came with the volume were unbound, and Wadsworth framed and displayed many of them in his home. In 1848 his son, Daniel Wadsworth, founder of the Wadsworth Atheneum, willed the engravings to the Connecticut Historical Society. Today, the engravings are accessible in the CHS Research Center. These vivid illustrations complement the adventurous narrative of Connecticut’s own world explorer, John Ledyard. “Thomas Jefferson to John Ledyard, August 16, 1786 - The Thomas Jefferson Papers.” Library of Congress, 2012. Link. Ledyard, John. A Journal of Captain Cook’s Last Voyage to the Pacific Ocean, and in Quest of a Northwest Passage, Between Asia & America; Performed in the Years 1776, 1777, 1778, and 1779. Illustrated with a Chart, Shewing the Tracts of the Ships Employed in This Expedition. Faithfully Narrated from the Original Ms. of Mr. John Ledyard. Hartford, CT: Printed and sold by Nathaniel Patten, a few rods north of the court-house, 1783. Link. Gifford, Bill. Ledyard: In Search of the First American Explorer. Orlando, FL: Harcourt, 2007. Ledyard, John, and James Zug. The Last Voyage of Captain Cook: The Collected Writings of John Ledyard. Washington, DC: National Geographic Society, 2005. Sparks, Jared. The Life of John Ledyard, the American Traveller; Comprising Selections from His Journals and Correspondence. Cambridge, MA: Hilliard and Brown, 1828. Link. Gray, Edward G. The Making of John Ledyard: Empire and Ambition in the Life of an Early American Traveler. New Haven, CT: Yale University Press, 2007. America’s First Planetarium – Who knew?